♦ Email the developer with any questions or ideas. Speak Better is a speech therapy tool and is meant to be used under the guidance of a qualified speech therapist. It helps improve speech clarity and articulation by offering visual and audio-based timing cues to help train your brain to speak at the appropriate speed with sufficient articulation. This is done by reading aloud as the app offers audiovisual cues (highlighting and metronome sound) at rhythmic intervals. These cues also help with breathing and relaxation techniques that your therapist may have suggested. Each word must be read aloud as it is highlighted. Launch Speak Better and tap the PLAY button. Speak Better will highlight each word in the text and step through each word. It dwells longer on commas and full stops. Read each word aloud as it is highlighted. 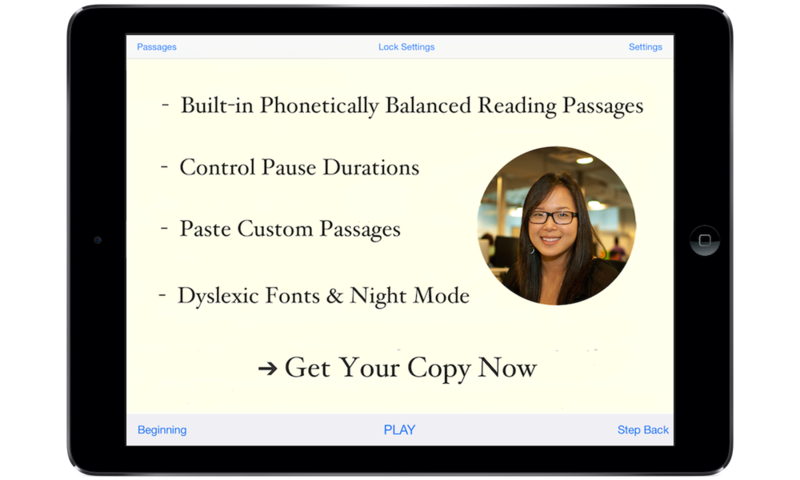 The app contains built-in reading passages that are phonetically balanced. These passages contain all of the English phonemes at representative frequencies. These are the best passages to begin practicing with. Tap the Passages button to see these phonetically balanced passages. You can build a library of your own text content by copying your text from another app and pasting it into Speak Better. After copying your text, tap on the Passages button (top-left) and then on the "Paste New" button at the top left of the new window. You can copy any text content from Safari, iBooks, or other apps before tapping the "Paste New" button. Speak Better can handle very long pieces of text. To Delete a pasted passage, simply swipe left on the corresponding item in the "Pasted Passages" section and tap on the red Delete button which appears to the right of the item. Change the Text Size by tapping on the "+" and "-" buttons in the Settings section. Scroll down in the Settings window to see all available options. 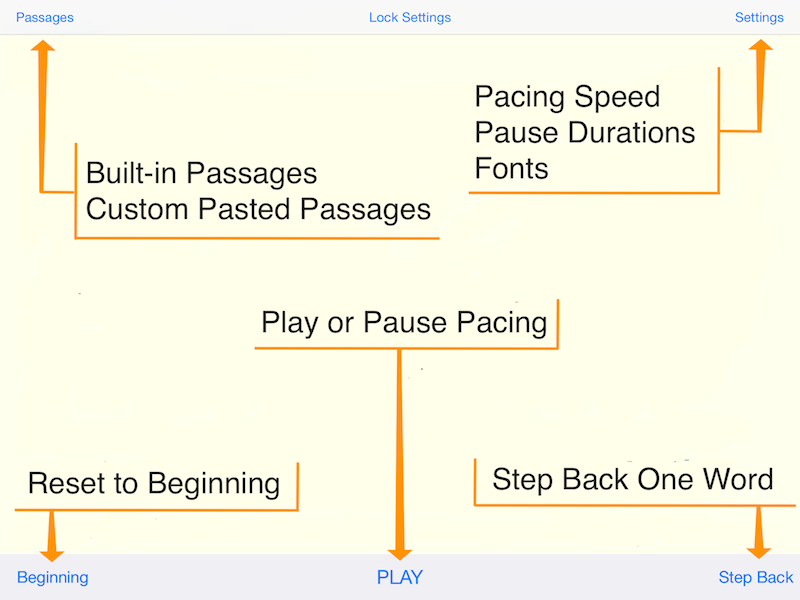 Change the highlighting speed WPM (Words Per Minute) by tapping on the "+" and "-" buttons in the Settings section. Tap the "Lock Settings" button at top-center to prevent accidental changes to the Settings section. Tap on the "Unlock Settings" button to make changes again. You can also use Tactile Pacing. Simply tap the blue bar at the bottom of the text to advance the selection. In the Settings section you can pick the "tap-and-hold" option to require a long-press for the specified duration (reflecting the WPM) before advancing the selection. Both of these operate on the same principle as your traditional pacing board to help entrain timing cues using touch. Speak Better does not track usage and does not log or send any data to an external server for any reason. There is no 3rd-party advertising within the app. It does not contain any 3rd-party software or services and all core features work offline even without an internet connection. Hi, my name is Navanit. I've been working on Assistive Technology and AAC software for several years, beginning with research I conducted as a graduate student at Stanford University. I make an effort to be easy to reach and interact with. If you have an idea, or need help, you can bring it up directly with me and be sure of a prompt response. Email me anytime.